Like the original string machines, String is a one-trick pony, but it's a rather good trick, we have to say. Classic sound. Easy to program. Efects are very musical. Low CPU usage. GUI response a little clunky. Limited range of useful sounds. Loomer String emulates the so-called string machines that emerged in the '70s: synths designed to mimic the sound of an orchestral string section. They didn't sound much like the real thing, but their distinctive sound made units like the Solina String Ensemble and Elka Rhapsody popular in their own right. String synths sounded different to polysynths of the day because they used 'divide-down' oscillator technology. Instead of oscillators that change pitch as you play, they might use a bank of oscillators to cover all 12 notes in the top octave of the keyboard, then 'divide down' each of those oscillators to cover the lower octaves and thus the entire keyboard. These produce a fairly thin tone, so to thicken them up and give a 'string section' effect, a built-in chorus circuit would be employed. These went beyond the usual single-voice design (ie, one modulated delay line mixed with the dry signal) and instead delivered an 'ensemble' using multiple delay lines (the famous ARP Solina had three voices, for example), each with its own LFO. String has two layers, each with its own divide-down oscillator, a simple AR envelope, velocity control and a filter section. The layers can be blended or triggered across different keyzones. The bypassable filter section has five modes: low-, band- and high-pass, HP/LP Pair (high- and low-pass in series) and nine-band EQ. The filters respond to velocity and aftertouch. The modulation section's LFO can be used for vibrato or filter modulation, and there's an envelope that can be applied to the filters, too. No string machine would be complete without chorus, and String's emulates the 'bucket brigade' design of analogue models, which used chains of capacitors as a primitive 'analogue sampling' method. String offers a vintage ensemble mode and a modern, thicker chorus. There's also stereo phaser and a stereo delay (which also features bucket brigade modelling). Loomer String is neatly laid out, easy to program and light on your CPU. The 80 presets cover a wide range of string sounds, with some split-layer presets and a selection of basses and leads. Being so straightforward, it's very quick and easy to customise presets to your needs. One quirk of early string synths was that the polyphonic divide-down oscillator arrangement was often connected to a single amplitude envelope, which meant multiple voices had to share the same envelope. Some synths handled this by retriggering the envelope every time a note was pressed, so that sustained notes were cut off abruptly when a new note was pressed. Others worked by passing any new notes through minus the envelope. To recreate the first of these two, each of Loomer String's two amp envelopes and the filter envelope features its own retrigger switch. When activated, this means the envelope retriggers whenever a new note is pressed. While in polyphonic mode, each voice has its own attack/release amp envelope. In Paraphonic mode, all voices within a single layer share the same amp envelope and the 'envelope bypass' effect can be emulated. Loomer Synth's sound quality is superb, with just the right balance of vintage tone and digital clarity. The sound could best be described as cinematic, albeit in a late-'70s sci-fi/horror fashion. 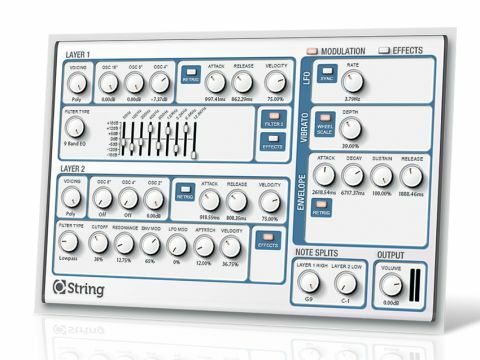 String can easily stretch from Vangelis-like soundtrack to Prodigy-esque sound module strings. Being a string synth, the range of tones is limited, and our most-used presets were simply variations on a theme. The basses and leads are nothing to write home about, but that's fair enough - you're not buying this synth for those. Loomer has managed to capture the simplistic sound and spirit of classic era string synths, and the excellent vintage-modelled effects are instrumental in its authenticity.